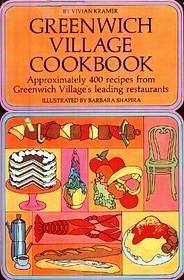 The Greenwich Village Cookbook is a repository of local culinary and cultural history. Published in 1969, it has nearly 400 recipes from 75 restaurants and coffeehouses then active in the Village, with affectionate profiles of each. Most are long gone now, but several are still in business, though the recipes from those days reflect cooking styles of half a century ago. My friends Frank and Vickie gave me a copy of the book recently, and last weekend I made them a dinner from it. 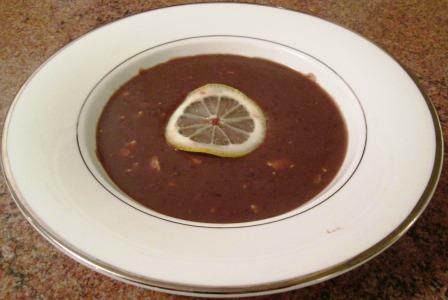 We started with The Coach House’s Black Bean Soup Madeira. Before it closed in 1993, the Coach House had been an immensely prestigious (also elegant and expensive) restaurant on Waverley Place for over 40 years, and black bean soup was one of its signature dishes. This was one of the most time-consuming soups I’ve ever made. I started by cooking black beans in plain water for 1½ hours. 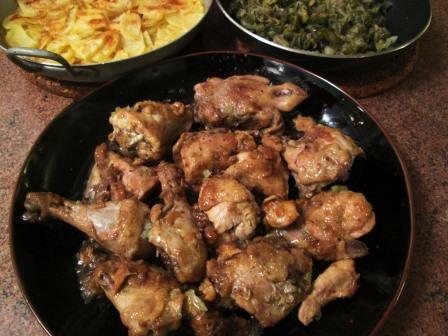 At the end of that time, I added a sauté of chopped celery, onion, and parsley lightly thickened with flour; a whole smoked pork knuckle, a hillock of chopped leeks, a bay leaf, salt, and pepper. All that simmered together for 3 hours, after which I discarded the pork knuckle and bay leaf and pureed the soup. Next was to add Madeira (I didn’t happen to have any, so I used an oloroso sherry), reheat the soup, stir in chopped hard-boiled egg, and – finally – float a thin slice of lemon on top of each bowlful. It was a terrific soup – subtly spicy, lush and filling. It made very clear why the Coach House had stood so long as a bastion of fine American cooking. Our main course was Chicken al Charro. El Charro Español is one of the surviving restaurants from those days: It still serves traditional Spanish food in its modest basement premises on Charles Street. Tom and I used to eat there in the early ’70s, and I often ordered its chicken, so when I found the recipe in the cookbook I knew I had to try to reproduce it. Unlike the soup, this was a fairly simple dish to make. I cut up a nice plump chicken, rubbed the pieces with a paste of crushed garlic, ground cumin, paprika, salt, and pepper, and dredged them with flour. I softened a sliced onion in olive oil, added the chicken pieces, browned them briskly, then lowered the heat, covered the pan, and let them cook until tender. Just before serving I sprinkled on some red wine and additional crushed garlic. That, along with the cooking juices in the pan, made a tiny sauce to moisten the chicken pieces. This was a good, lively dish. It was important to have a really flavorful chicken; I think a bland supermarket bird would’ve been overwhelmed by the spicing. The final garlic addition was fairly pungent, but it was balanced by the other seasonings. My dish didn’t fully equal my recollection of the restaurant’s long-ago version – but the warm glow of memory and nostaglia has probably gilded that particular lily. I could check it out, though: Pollo al Charro is still on the menu. For a small fruit dessert, I chose Oranges à l’Arabe, attributed to Casey’s, a long-defunct down-home French-New Orleans-jazz restaurant on West 10th Street. There didn’t seem to be anything very Arabian about the recipe, but it sounded attractive. 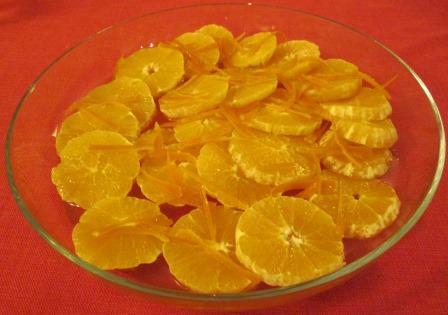 I peeled four oranges, made slivers of some of the peel, and cooked the slivers in sugar syrup for 30 minutes. When the syrup was cool I stirred in dry curaçao, poured it over the sliced oranges, and put the dish in the refrigerator until needed. It was very simple and very refreshing – a pleasant finish for a pleasant meal in the style of the Greenwich Village of our youth. I look forward to reading your review of the restaurant’s current Pollo al Charro offering. Interesting how delicious dishes fall out of favor, and even more interesting how tasty they often are when we revive them. Nice story and images. The food looks wonderful.